In the context that this verse was written in the Old Testament, Isaiah was referring to God’s presence returning to the nation of Israel after a time of chastisement. When John the Baptist speaks of preparing the way for the first coming of Jesus, he quoted these words of Isaiah. They are recorded in all four gospels (Matt. 3:3, Mark 1:3, Luke 3:4 and John 1:23). The NIV translation of the Bible states Isaiah 40:3 as “prepare the way for the Lord” while the NKJV says “prepare the way of the Lord. We are to prepare the way for the Lord in our lives by living and preparing our lives according to the way of the Lord. I had to “Pitch, Pack and Ponder” in order for me to prepare the way for the Lord to move in my life the way He desired as we moved into a new home. I had to prepare myself physically, emotionally ad spiritually in order to live according to the way the Lord had planned for me. I searched for a Bible story that would give me an example of pitching, packing and pondering during a move. I was reminded of the Israelites as they began their Life-Journey-Change experience of moving from Egypt to the Promised Land of Canaan. Join me in a scripture study of the Israelites as they prepared to cross over the Jordan River into the Promised Land. In chapter 11, the Lord informs Moses and the people that soon they will be pitching their past and packing to leave Egypt. The Lord relates to Moses how to prepare for change that will result in their exodus from Egypt and slavery. ***In verses 6-8, they are told to slaughter a lamb on the first day of the month. Then they are to put blood upon the door frame and eat the lamb. ***In verse 8, they are to eat bitter herbs that were symbolic of the bitterness of slavery they were going to pitch. *Verses 12-23 instructs the Israelites that they are to celebrate the Feast of Unleavened Bread because it commemorates their release from Egypt. Instructions are given for how to celebrate it. *Verses 31-32 Pharaoh tells the people to GO worship the Lord as requested and to take flocks and herds with them. *Verses 34-36 tells of the dough the Israelites took with them along with silver and gold and anything else they requested that had belonged to the Egyptians. *Verses 37-42 The Israelites began their journey that would last 430 years. In chapter 12, the Israelites are preparing the way for the Lord to move in their circumstances by preparing the Passover meal according to the way of the Lord. The Israelites packed and pitched. They did all of this without pondering or questioning what they were asked to do. However, they were also given instructions as to how they were to ponder in the future. While we were preparing for change, I was so busy pitching what we did not need and packing what we did need that I forgot to do any pondering! Only after the physical move did I read an article by Elizabeth Sherrill in Guideposts that helped me see my need to do some emotional and spiritual pondering. I needed to ponder some spiritual milestones and sort through some family events that transpired in our Webster home. I finally took time to mentally walk through each room of our former home and ponder the special events I wanted to remember. In the family room I saw the Christmas tree and the personalized stockings hung by the fireplace each year. The bedrooms of our children were special because in these rooms they both progressed from sleeping in cribs to regular beds to sharing their beds with their spouses. It was also in their rooms that each of them prayed the prayer of salvation asking Jesus into their hearts. Family, friends, holidays, graduations, weddings, etc. etc. etc. This exercise helped me pack away many memories in my mind. I also came to realize that I could unpack these thoughts any time I wanted and that I could ponder the memories no matter where we might be living. Some things were probably better off being pitched (not remembered) but many treasures would always be only a thought away. The best thing I realized while I pondered was that God had orchestrated all the happenings of my life in the past and that He would continue to do so in the present and future. The concept of each one of these P words is developed in various scriptures throughout the Bible. Let’s look at a few examples of spiritual pitching, packing and pondering. You may want to read Psalm 31 that was written by David after he had sinned with Bathsheba. Especially note verse 10: “Create in me a pure heart, O God, and renew a steadfast spirit within me.” You can pray this prayer to pitch sin from your life just as David did. God wastes nothing so do not forget what you have experienced. Paul reminds the Corinthians not only about the sacredness of the Lord Supper that was instituted by Jesus but he also quotes the words Jesus used when He first shared the bread and the cup with His disciples. Paul points out to us not only the most important thing for us to ponder and remember, but how to do it. “Do this in remembrance of Me” is the command given by Jesus recorded in Matthew 36:26-30 and Mark 14:22-25 regarding the Lord’s Supper. No matter at what point we are in our life’s journey, the most vital thing we are to remember and ponder is the fact that Jesus died for each and every one of us. Always take time to partake in communion so that you can “come into union” with the Lord through all the changes you encounter on your journey of life. After all, is not our Christian communion foreshadowed in the Passover Feast of the Jewish people? Think back to Exodus 11 and 12 that we studied earlier. The Israelites put the blood of a lamb over their doors so that the angel of death would pass over them when it struck the Egyptians. Now Jesus is the Lamb of God who shed His blood for us so that we may live and not die. The Israelites remembered and so must we remember. Today we have been “Pitching, Packing and Pondering” regarding our physical lives and our spiritual lives. We have found examples for both the natural and spiritual in the Bible. I have shared how these words applied to me when we moved to our new home. Now it is your turn to act upon these words regarding your own life. Please feel free to send me any responses you would like to share. Just as I could not move from one house to another without doing some pitching and packing and pondering, neither can you or I move from one spiritual level of understanding to another without doing some pitching, packing and pondering. God says that He makes all things new in Revelation 21:5, so get ready for change. How do you get ready for change? Our master key verse of Isaiah 40:3 says to prepare the way of the Lord. So, prepare the way for the new thing God has for you by pitching, packing and pondering things that are currently part of your life. For further study: You might enjoy applying the concept of Pitching, Packing and Pondering” to the parable of the prodigal son as recorded in Luke 15:11-32. 1-2-3 . . . . I am counting the number of “Ps” on my plate of life. 101-102-103 . . . . I am counting the number of boxes we packed five years ago as we prepared for our move to a new home. Once again, I needed to spend some time alone with the Lord so I could hear what He had to say. The Bible verse “Prepare the way of the Lord.” found in Isaiah 40:3 NKJV became significant to me. As I read this passage in various translations, I discovered something that seemed important to me. The New International Version translation states Isaiah 40:3 as saying “prepare the way for the Lord” rather than “of the Lord” in the New King James Version. Although the difference is only one little preposition, the meaning seems different to me. I like to combine the wording of both translations for a more inclusive statement. My conclusion is that I am to prepare the way for the Lord in my life by living and preparing my life according to the way of the Lord. As with the previous “P” words that the Lord had given to me, I discovered a phrase that had a meaningful message for me. The phrase that stuck in my head was “Pitch, Pack and Ponder.” I was pitching things we no longer needed and would not take with us to our new home. I was packing things we would use no matter where we lived. But pondering about things?? I had to ponder about pondering! It was a helpful exercise for me emotionally and spiritually. Pitching, Packing and Pondering can still be beneficial for me today. I need to apply the three Ps of pitching, packing and pondering to “stuff” just because I can accumulate more things than I truly need. If I take the time to think about whether or not I need a specific item, it helps me to decide whether I should keep it or get rid of it. I also need to “pick, pack and ponder” things emotionally. I will benefit from taking time to process in my mind whether “something I have heard or seen” has a beneficial lesson for me to learn and remember. I might also discover that it could be detrimental to me or someone else if I recall an incident that should be forgotten. “Pitch, Pack and Ponder” helps me to move forward in my emotional and spiritual life just like these activities helped me prepare for our move and adjustment to a new home. My Reader, do you need to do some pitching, packing and pondering in your life? Take a look at the Bible Study for Preparing Change as it may be helpful to you. Please feel free to share your comments with me. After it has been confirmed to you that your perceptions were not only your own ideas but were desires planted in your heart by the Lord, you are ready to take the next step of pursuing change. The first step in our journey of life leading to change was Perceiving Change and now we are ready to take the next step of Pursuing Change. With this new step, we need to be aware of the differences between expectations and expectancy. How do you differentiate between the terms “expectations” and “expectancy”? Let me give you a personal example of how I let expectations overtake my original expectancy. We were at a very nice dinner that had included appetizers, salad and a complete entrée. 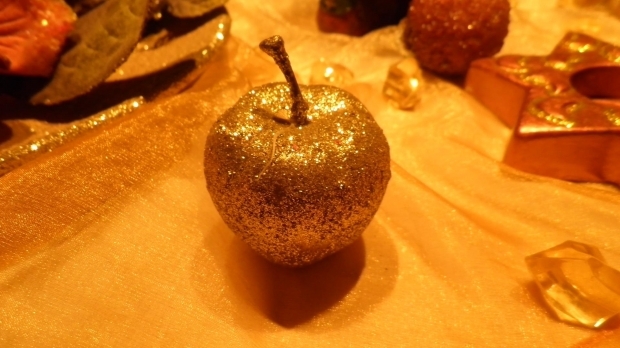 When it was time for dessert, we were told that something sweet was coming. We waited with expectancy for what was to come. The waitresses came around and removed all unused silverware. We were left with a spoon. I had always heard that if a person was given a spoon for dessert it would not be as decadent as if one had a fork. My expectancy was limited by my expectations of probably being served ice cream. (However, that would not have been bad after all we had already eaten!) I was soon proven wrong as we each were served an individual dish of delicious chocolate mousse. As if this were not enough, we were then served plates of warm fresh-baked chocolate chip cookies! At that time we were introduced to the chef and were told the reason he had not come out earlier was because he was baking the cookies so they would be as fresh as possible for us. My expectations were far exceeded and expectancy certainly should have been my mindset from the beginning! We set boundaries with expectations. Expectancy gives God permission to do what He desires. Expectancy goes beyond any imaginable expectations. How do you live out your life’s journey – by expectations or with expectancy? How do you handle changes – by expectations or with expectancy? Let us look at the importance of expectations and expectancy in the lives of three women recorded in scripture. I believe expectancy was in their hearts for the children to be born who would become this great nation. However, expectations took over Sarai’s heart when many years went by without her bearing children. She developed expectations of how and when the promise of a son would be fulfilled. Expectations by Sarah were based on what could be seen in the natural. Expectancy in Sarah’s life was beyond the natural; it was supernatural. Sarah lived in the time of the Old Testament rather than the New Testament. However, this verse would have been very good for her to rely upon. Be sure to claim it for yourself because we have it recorded in our scriptures today. Sarah had times of both expectations and expectancy in her life. The same will be true for us. In your daily life, do you tend to rely more on expectations or do you live more with expectancy? What do we hinder in our lives when we take things into our own hands and do not wait for God or do not allow Him to do it His way? She vowed that if she were to bear a son, she would give him to the Lord all the days of his life. Her whole prayer reveals the fulfillment of her expectancy. I believe Hannah was one of the people fully committed to the Lord. Hannah felt the influence of expectations from society and her religion; she overcame them by relying upon God with expectancy. How are your decisions influenced by society or religious rules? How are you able to overcome these expectations and live with expectancy for what the Lord has for you? Will God find you as one who is faithful when He looks for those whose hearts are fully committed to Him? As a girl, Esther most likely had expectations of growing up with her parents, but these expectations were crushed when her parents died. (Esther 2:7) We see she grew up to be a woman of great faith who surrendered to the Lord with great expectancy. (Esther 3:14) This whole story is told through her experiences to become the new queen for King Xerxes. King Xerxes desires a new queen and Esther 2:1-4 explains how the girls were prepared to be presented to the King in order for him to choose a queen. In Esther 2:17, Esther is made queen. In chapters 3 and 4 there are encounters between Mordecai and Haman that led to Esther being asked to approach the king on behalf of her people, the Jews. Expectations are stated by Esther herself in Esther 4:11 saying that anyone who approached the king without being summoned could be put to death. In Esther 3:6-15, Haman issues an edict against the Jewish people and in Esther 8:5-17 Mordecai issues another edict in favor of the Jews. This scripture is fulfilled in Esther’s life. In Esther 4:14, Mordecai says, “And who knows but that you have come to royal position for such a time as this.” Is there a situation in your life that you feel God has ordained you to be in a specific place for a special purpose? Esther was able to respond to the statement quoted above by saying she will go and “if I perish, I perish.” Can you daily live each day with this kind of expectancy? Although you do not fully know all that God has planned for your life, can you rely upon the power of the Holy Spirit to walk with expectancy? Do not live by the expectations of what you want God to do. Live with the expectancy of what God wants to do for you. As I continue to reflect upon our Life-Journey-Change of five years ago, I still know today that Life is a Journey that involves Change and that I must embrace Change to continue my Life. Pursuing Change was the second “P” to be added to my dish of life. For us, Perceiving Change in life was more exciting than Pursuing Change. My husband and I had fun when we started looking at the possibilities available regarding our changing the address of where we called home. It became a more serious task as we pursued looking at open houses for sale on the weekends. We would continue pursuing a change in the place we would call home, but now I went about it with an excitement and expectancy of what the Lord would reveal rather than just pressing forward with my own expectations. My husband kept telling me that we were not in a hurry and that we would find something. I had to listen to and trust both my husband and the Lord. One particular quote that I like by William Paul Young in The Shack says, “To the degree that you resort to expectations and responsibilities, to that degree you neither know God nor trust God.” I have come to the conclusion that a person can set boundaries with expectations while expectancy gives God permission to do what He desires. Over time, another scripture has become important to me. I like the New Kings James translation of Ephesians 3:20, “Now unto him who is able to do exceedingly abundantly above all that we ask or think, according to the power that works in us.” My personal expectations may have led to some disappointment for me during the time we were pursuing change, but when I changed my focus to expectancy and relied upon God, He certainly provided exceedingly abundantly above and beyond anything that we had put upon our list of requirements for a new home. There are many amenities in the home where we now live. We sometimes feel we have much more than we need. Pursuing Change was a good “P” to be added to my dish of life. While delving into numerous scriptures I discovered that I was not the only person to struggle with expectations and expectancy in life. Join me in this week’s Bible study as I show how Sarah, Hannah and Esther also dealt with these concepts in their lives. My Reader, I challenge you to consider the options of expectations and expectancy in your life. A couple of our granddaughters used to like to play hide and seek when they were about 2 years old. They each had their special hiding spots and I had to find them. Then in turn I had to hide so they could find me. If they could not find me, I would quietly say, “Peep, peep!” as a clue for them to find my location. No matter who was hiding or who was seeking, the result was always a big hug when we were back together again. Sometimes God likes to play this game with us as well. Yes, there are times when we hide from Him. However, He will always find us. (That is another scenario that we are not going to focus upon at this time.) We are going to think about when God hides things from us and chooses to reveal them at a later time. He never leaves us or forsakes us, but neither does He want His presence in our lives to become mundane. In his book The Shack, William Paul Young quotes the personification of God as saying, “The chance to hide so many wonders from you is an act of love that is a gift inside the process of life.” Just as my granddaughters and I expressed our love with a hug when being found during our game of hide and seek, God embraces us when our relationship with Him is deepened as we find Him in a circumstance where we thought He was hidden. Sometimes God may need to give you a clue as to what He is really doing before you see His plans and purposes, but He truly knows best. While taking some liberties, I believe God plays hide and seek with us and He played it with His Son, Jesus. Let us look more deeply into this concept with our Bible study of Matthew 2 and John 19. During this study, we are going to delve into some scriptural events in the life of Jesus where their full meanings were once hidden and then revealed later. By comparing accounts of Jesus’ last hours on earth in John 19 to the story of the Wise Men in Matthew 2, we are going to discover hidden meanings in the gifts given by the Wise Men to Jesus in correlation with the last events of Jesus’ life and the words He spoke. I imagine that as a two-year old Jesus would have preferred a ball to gifts of gold, frankincense and myrrh, but God ordained these gifts to be given to Him because they foretold of hidden meanings that would be revealed at the time of His death. God even used a GPS, Guidance from a Personal Star, to help the Wise Men find the One they were seeking to whom they would present their gifts. The Wise Men played a game of hide and seek with God. I played a game of hide and seek with my granddaughters. God still plays a game of hide and seek with each of us. The outcome is always the same. There is joy whenever who was hidden is found and the relationship is deepened between the players involved. “Wise Men still seek Him” – Are we wise men and women? We are to crucified with Christ (Gal. 2:20 – myrrh) so that we may be living sacrifices pleasing to God (Rom. 12:1) with the pleasant aroma of Christ (II Cor. 2:15 – frankincense). When this takes place, then the kingdom of God will be in us (Luke 17:21 – the kingdom requires a king – gold). May we acknowledge the hidden prophetic meaning of the gold, frankincense and myrrh. Also, may we receive the revelation of these gifts in the life of Jesus. And most of all, may we embrace these gifts into our own lives, even when the big picture may yet be hidden and not yet fully revealed. Colossians 2:2,3 from the Living Bible expresses the meaning of our Master Key Verse by saying, “God’s secret plan (hidden), now made known (revealed) is Christ himself. In Him are hidden all the mighty unwrapped treasures of wisdom and knowledge.” As we perceive wisdom and knowledge in our journey of life, God’s plan will no longer be hidden, but it will be revealed, or fulfilled in our lives as we allow change. Do not be afraid to add Perceiving Change to your Life-Journey-Change. If a perception of change that comes to your mind is part of God’s plan for your life, He will reveal it more fully to you in time; and it will bring glory to Christ who is in you. I share with you a quote by Sarah Young in Jesus Calling, “The path I (Jesus) have called you to travel is exquisitely right for you. The more closely you follow My leading, the more fully I can develop your gifts.” Enjoy your game of hide in seek with the Lord throughout your life’s journey of change. Author’s note: I would appreciate any insights and comments you would be willing to share. Thanks for taking time to respond. Last week I introduced a series of blogs that will evolve over the next eight weeks. I shared how each of us takes our own unique journey through life resulting in various changes during life. In turn, we need to embrace these changes in our lives. I entitled my previous blog “Please Pass the ‘Ps” because each step of a specific journey I took entailed a “P” word that described what I was experiencing during that moment. At the conclusion of my journey, I had a plate full of “Ps”! My dish of life was abounding with perceiving, pursuing, preparing, processing, possessing, permitting and proclaiming change. My Reader, are you ready to join me in adding the first “P” to your plate of life? While I share the phases of change I experienced while on a specific journey in my life, you can apply my insights to your personal life. The first “P” the Lord presented to me during our transition into a new home five years ago was “Perceiving Change.” I searched the scriptures to confirm what I was sensing to be a word from the Lord. I found Isaiah 43:18-19, “Forget the former things; do not dwell on the past. See I am doing a new thing. Now it springs up; do you not perceive it?” This was my word of encouragement persuading me to perceive a change in life. My husband perceived our move before I did, but soon we were both involved with looking at new home possibilities. It was fun looking at various options, but I also began to wonder about the specific house and area where we would settle. I did not want to worry but my mind started going down various uncharted paths as we began this journey. It was then that God spoke to me that our new home was currently hidden from us but would be revealed at the right time. My title for the concept of Perceiving Change became “Hidden … then Revealed.” I found comfort in Paul’s words in Colossians 2:2b-3, “that they may know the mystery of God, namely, Christ, in whom are hidden all the treasures of wisdom and knowledge.” Whether applying this verse to my physical journey or my spiritual walk, I discovered that Christ reveals things to me little by little. In the natural realm, I did not know where our new home would be. Spiritually, I also knew, and still know, that I have not grasped all there is to know about God. Much of God and His plans are mysteries to me – that is why we are called to a faith walk. Regarding a new home, God promised that He would lead us to a new place to live just as He continues to reveal more of His spiritual nature to me allowing me to grow in the knowledge of Christ. “Hidden things” are continually being “revealed” to me. Although I felt that God was currently hiding the perfect house from us, I also felt confident that He would reveal that house to us at the right time. I started praying each time we looked at a house or drove through an area. I would pray that if the particular house we were looking at was to be ours, that the Lord would reveal it to both of us. We could have used a GPS to direct us to the locations of the houses we looked at, but we often used a map because we wanted to get an overview of the whole area. However, in a sense we did have a GPS with us. It was not a Global Positioning Satellite but rather it was God’s Promises in Scripture. We held on to such scriptures as Psalm 127:1 that says, “unless the Lord builds the house we labor in vain.” We did not want to labor in vain; we only wanted the house the Lord had built for us. In a sense, God engaged us in a game of hide and seek. God was hiding and we were seeking. I knew at the right time, we would find God’s plan for us. One day I was studying John 19. Taking some liberties, I envisioned how God the Father could have played a version of hide and seek with Jesus during His life on earth. 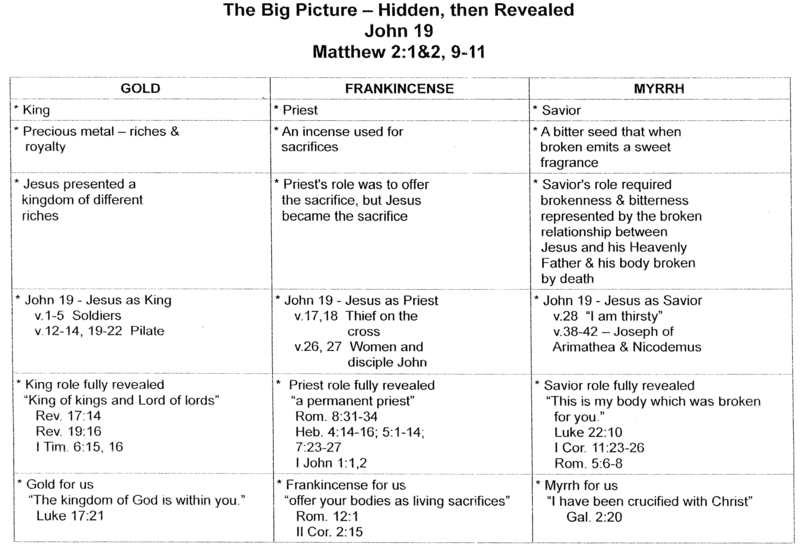 Through symbolism, God hid some things about Jesus’ life in Matthew 2 and then revealed their significance in John 19. What God the Father hid, Jesus the Son revealed. My Reader, do you feel like God is asking you to pursue a change in your journey of life? Is He asking you to add the “P” of Pursuing Change to your life’s plate? We often say that we do not like change, but if we do not pursue a possible change that the Lord is asking of us, we may be hindering our journey with Him in our life. Will you trust Him to reveal more of what may currently be hidden from you? I hope you will look at this week’s Bible Study post entitled “Hidden … then Revealed” to find out how the spiritual version of hide and seek was played in two of the gospels. God may be playing this game with you as well. Be assured, He will reveal Himself when you pursue His plan for your Life-Journey-Change. If I were to I take the three statements listed above and build them into the 3 sides of a triangle, it would illustrate the connection of these concepts. There really is no beginning or end to the cycle. There can be no Life without a Journey; there can be no Journey without a Change; there can be no Change without Life. The cycle of Life-Journey-Change has both natural and supernatural applications. We understand “live” (life) and “move” (journey), but what about ‘have our being’? “Being” is one’s fundamental nature – the fulfillment of possibilities. “Being” is also a present tense verb signifying continual changes. From this, I conclude that “being transformed into His likeness” (change) is the fulfillment of possibilities for us. Life-Journey-Change is a sequence that we can see portrayed in both our physical and spiritual lives. Let’s see how these three words are fulfilled in God’s Plan, Promise and Purpose for us. Life begins when conception takes place in a mother’s womb. Journey is walking out the gift of life given to you. Change occurs as you allow God to conform you into His likeness. Life that God offers goes beyond your present life on earth. Journey can now be walked out in the light with Jesus Christ and other believers. Change causes you to become a new creation. Life will offer you more than anything you have previously experienced. Journey will be directed by God as you listen to him. Change occurs so that now you live by faith rather than sight and Jesus Christ lives in you. Let’s take time to see how the cycle of Life-Journey-Change evolved in the life of a man named Saul who later became known as Paul. His story is found in the book of Acts. Early Life – This man began his life known as Saul who persecuted the early Christians. Journey – He traveled from Jerusalem to Damascus, approximately 175 miles. Change – He had a personal encounter with Jesus on the Road to Damascus that resulted not only in a name change from Saul to Paul, but his Life’s purpose changed from persecuting Christians to proclaiming the news of Jesus Christ to Jews and Gentiles so thy might become Christians. New Life – Saul becomes known as Paul which is symbolic of a new life with a new name. His life is now lived for Christ rather than for himself. Journey – He makes three missionary journeys during his lifetime. Change – The lives of many people were changed and churches of new believers were established because of not only Paul’s three missionary journeys, but also because of letters he wrote to these churches. Lives today, including ours, are continuing to be changed as we read the scriptures and allow God to work in our lives. *Paul’s life changed when he encountered Jesus on his journey to Damascus and embraced the change Jesus presented for his life. Your life also will be changed as you personally encounter and embrace Jesus on the journey he has planned for you. Where are you going on your journey? As you reflect upon the questions in the previous paragraph, please answer these questions from both physical and spiritual perspectives. A physical change and response often occurs before there can be a spiritual change and blessing. Our Life-Journey-Change experience of moving into a new home was a physical time of change for us, but I must say this Life-Journey-Change experience has also presented me with the opportunity for spiritual change. The Bible studies I will share over the next 8 weeks are the result of spiritual growth and blessing for me. If we will allow our lives to be a journey of following in Christ’s footsteps, we can be changed into His likeness. God desires for the changes a person encounters during one’s earthly life to prepare him/her to live with Him eternally. Jesus came to live and die on earth so that when we die we can live with Him eternally. Jesus’ earthly life showed us the path for our Life-Journey-Change and His heavenly life gives us the power with which to live life and walk the journey in order to be changed into His likeness for evermore!